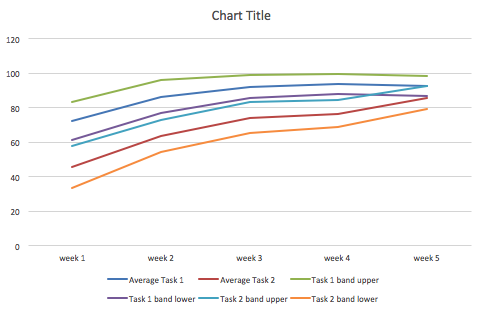 This tutorial describes how to create error bands or confidence intervals in line graphs using Excel for Mac. Excel has a built-in capability to add error bars to individual time points in a time series, but doing so can make the graph look messy and can conceal the overall shape or trend of the time series’ error. Shaded error bands provide good estimates of uncertainty without distracting from the time series. Creating error bands in Excel isn’t as straight forward as creating individual error bars — but never fear, this tutorial will show you how. The rows should contain the averages and uncertainty measurements associated with each condition and the columns should contain measurements over time. In the example above, I use standard error but you could also use a confidence interval, standard deviation, variance, or any other measurement of uncertainty. Below the rows containing the averages and standard deviations, we will add additional rows for the upper and lower bound of each error band. To find the upper bound of an error band, simply add the error to the average. So in our example, I added the average (cell C2) and the standard error (cell c4). Similarly, subtract the error from the average to find the lower bound. In this example, I subtracted the standard error (cell c4) from the average (cell C2). Find the upper and lower error bound for every time series in your data. Finally, apply the formatting to the other columns by highlighting the cells containing the upper and lower error bounds, and dragging the blue square on the bottom right of the box across the rest of your data columns.